Now usually if I had come across a product like this with such a hefty price tag (more about that later) I would have just walked on by. It's the cynic in me! But because I witnessed its effects on someone first, I really wanted to give it a go. Although my eyelashes are dark, I wasn't blessed with long ones. Now whilst it's obviously not the worst affliction in the world, I've always wanted longer lashes. And then, when I was having my make-up done by a make-up artist a couple of months ago, I commented on how fabulous her lashes were and I asked her if they were false. She told me that they weren't, that her lashes used to be like mine and that she used Revitalash. And in my mind, the deal was done! Now, at £65.95 this is by far and away one of the most outrageous purchases I've made but I've squared it off by trading in more expensive mascaras for cheaper ones for the next....ten years or so. So as to how it to apply it. It comes with a very fine brush and you simply "paint" the product along your top lashes. And you have to be patient - very patient. At first the changes are imperceptible - just as they would be if you were measuring your hair growth. But then suddenly they look much longer and there's more of them. And then with mascara they really come into their own. I'm not sure when they reach their "optimum" length but I've been using this for about 6 weeks now and I'm definitely getting there. 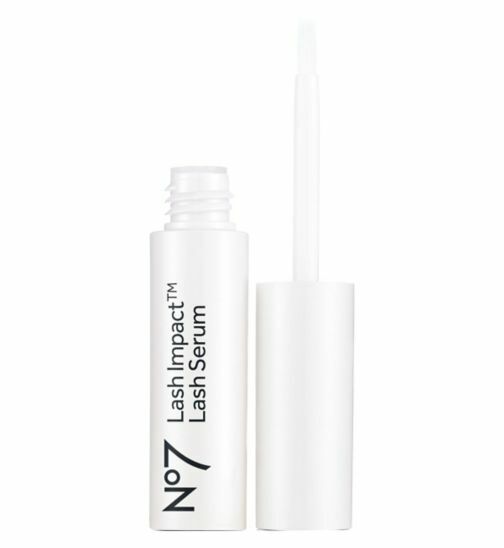 As an alternative, I've recently come across this No 7 Lash Impact Lash Serum (£16) and the reviews for it are really good too. I will definitely be investigating it in the future. This product seems to be great for people whose eyelashes are thinning due to the menopause, or which have suffered due to having false eyelashes, or if the lashes have fallen out through stress. Or if you just fancy a little va-va-voom in the lash department. *I should just mention that although the product has worked for me and I've never had any problem with it, I do think that it's worth doing your research and reading the reviews before buying - just in case you decide that it's not for you. I would love to hear from anyone who is a long term user, who has used different brands and what they think of each, or from people who hated it! This post comes with a warning - and several caveats! First, please excuse the tired face. The day that these photos were taken, I went up to Durham with our eldest and we had to be up at 5am to get there for a 10am start. And it doesn't matter how early I go to bed the night before, I always feel like a bag of poo by about 11am. Secondly, yes, I am wearing a purple bra! I don't think that I was planning on taking my clothes off in Durham :) And thirdly, yes I am also wearing my fitbit. Oh, and the reason I'm leaning against the changing room wall (apart from being in need of a rest) was so that I excluded from the photo, the pile of clothes that I'd just chucked on the floor. So, now we've got all of that out of the way, let's take a look at this H&M dress which I found in the Durham store. Apparently it's new stock and I can't find it on the website yet - but it's one of those dresses that I felt was a bit of a gem and which I wanted to share before they all came and went. It's gorgeously pretty - if you like that sort of thing. Personally I find summer dresses quite hard to find, well at least ones that I like enough to buy, although oddly I've recently added one or two to my collection (thanks Mr SG for being 50 soon. Very convenient.) But this one has sleeves, a good length to it and enough coverage so as not to feel too naked. The under slip is too low on me at the front (I had to choose my photos carefully show as not to flash any cleavage) so I will either turn the under slip around and wear it back to front, shorten the straps, or buy another one. Have a super weekend everyone and let's hope that the sun shines! I'm going to have to ask you to bear with me on this one because these shoes really don't make a very good first impression do they? If you were out on a date with them you'd maybe have a G&T with them before making your excuses and leaving. 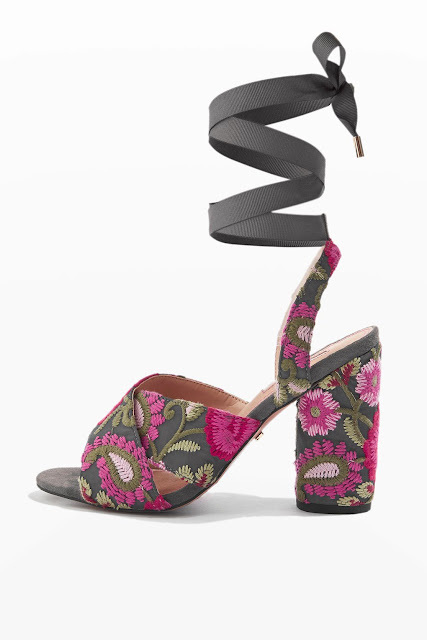 And as for thinking about having them in your wardrobe? Well in some ways they're not really an obvious choice. But then let's take a minute to think shall we? Because stranger things have happened. I mean people wear furry Birkenstocks after all. I tried a pair of these yesterday and in that odd sort of "these are so horrible I quite like them" kind of way, they suddenly became quite appealing. For a start they're a little different to what has been around for the past few seasons (well, other than way back in the 90s) and that's always a good thing because when you've done quite a few summers (like I have) it's good to see something different. And they're flat. Which for Mrs Sensible in the corner (i.e. me) that's a really good thing. They also offer a decent amount of foot coverage so for people who don't want too much on display, that too is a good thing. 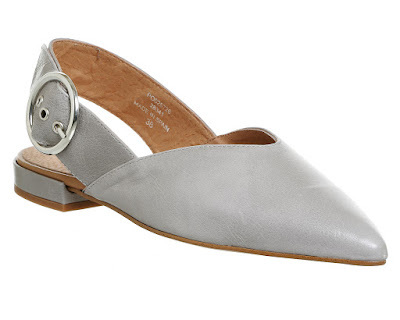 But the sling back makes them slightly more summery. Am I persuading you?! 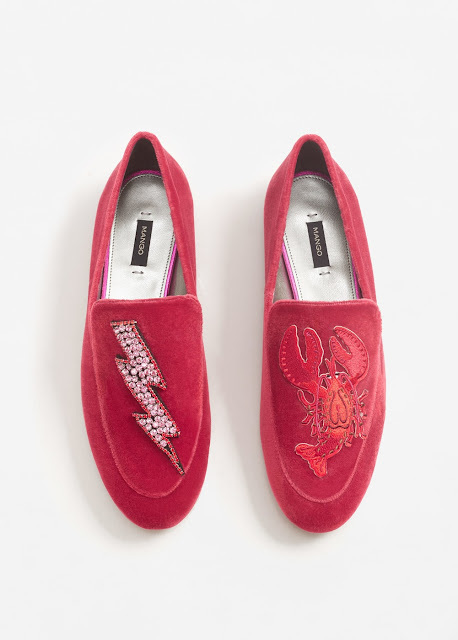 A lot of the styles are fairly pricey - but the New Look ones (above) are a good price point and a great choice for those who prefer not to wear leather. 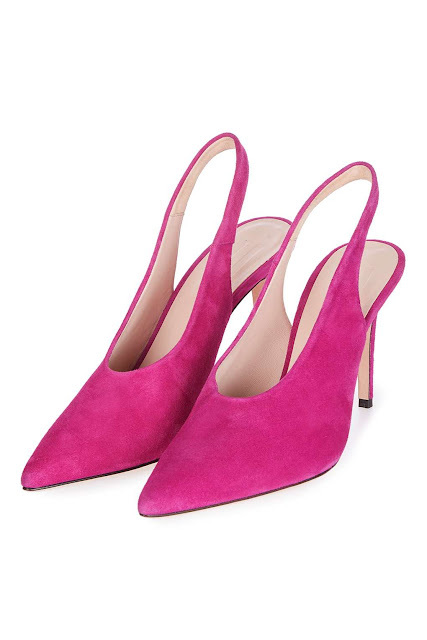 And whilst we're considering the pros of these little babies, let's look at the "V" styling at the front - which makes them really flattering and leg lengthening. Which may go some way towards counteracting their ability to create cankles. 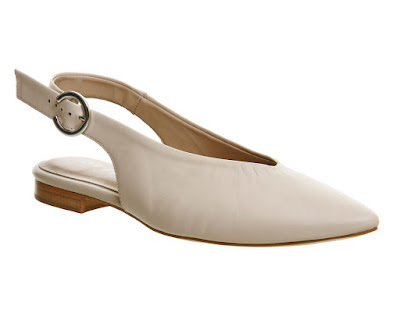 These Autograph leather slingbacks from Marks and Spencer (£49.50) come in black, as well as white, and they also come in half sizes. It's good to see M&S in on the act! 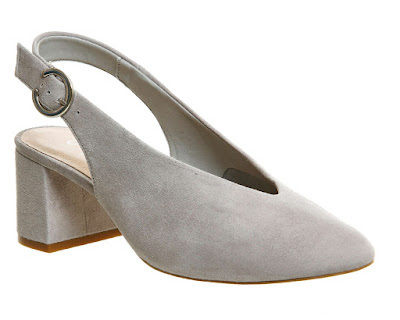 Now maybe a block heel will increase the appeal of these slightly ugly ducklings - which I have to say are growing on me the more that I write this post. 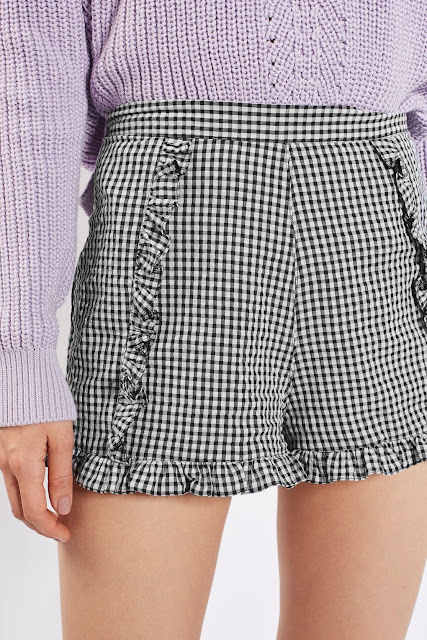 I like the idea of these with a midi skirt - probably my pleated Topshop one that I lived in last year and that I'm wearing now. 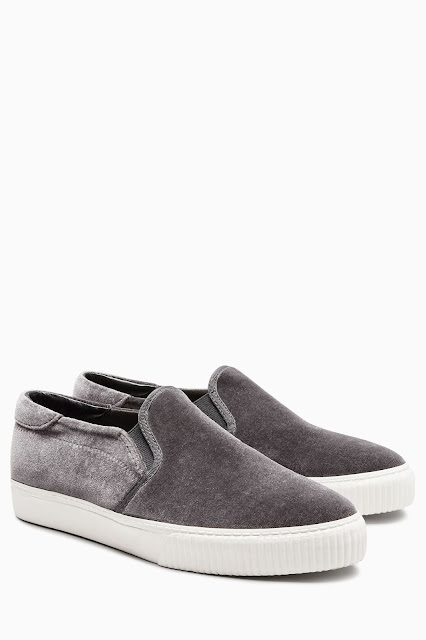 I'm trying to get myself out of trainers but I'm finding it hard to wean myself off them as they're so comfortable. 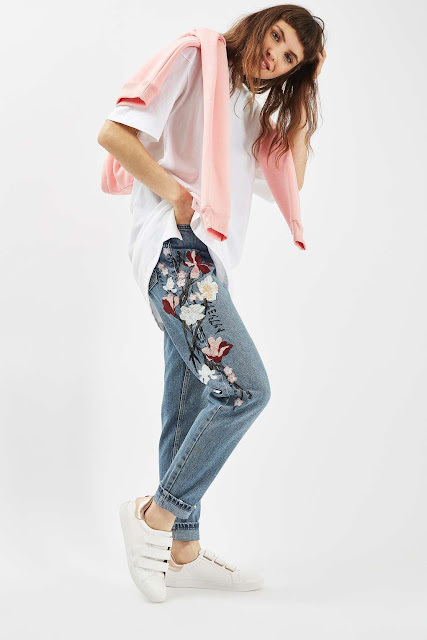 With straight leg, slightly cropped, jeans these too would be great. 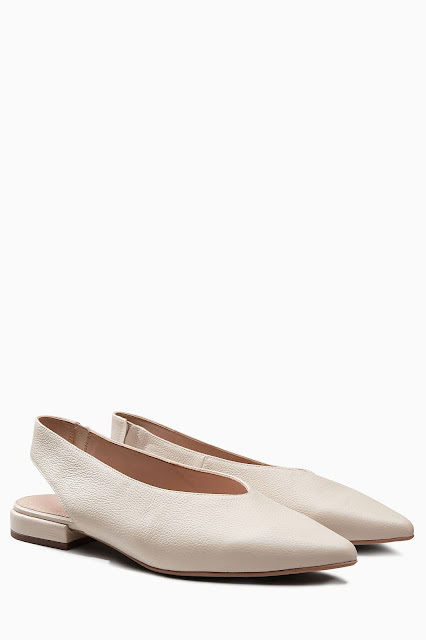 I think that for people as pale as I am, a little fake tan on the ankles also assists against these paler grey and cream colours. 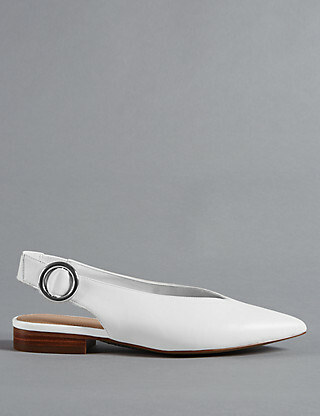 But where this style of shoe could really come into their own is with a heel. 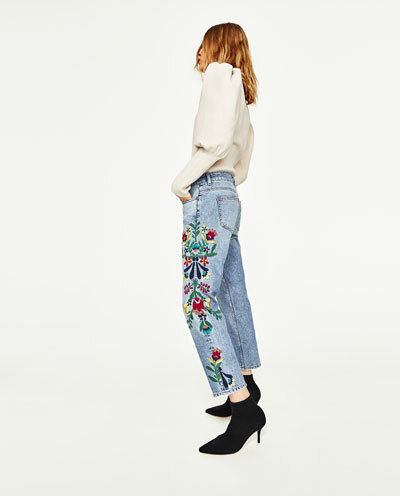 Maybe if there's an event coming up, such as a wedding, the races, or a birthday party and you have an outfit that's been worn before but which just needs a lift, these could inject what's needed to bring the outfit up to date. Plus, they can be worn again with jogger style bottoms and a white shirt, or jeans and a fancy pants top. And again, for some that are a great price, look no further than good old New Look. I'm heading into town in the next few days so I'm going to have a good try on and see what I think. Where do you stand on the v-throat toe sandals? 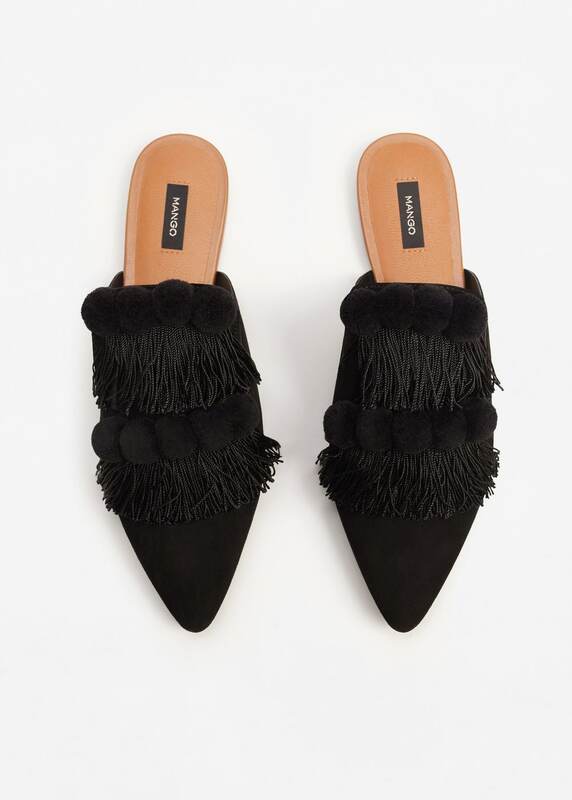 Love them, loathe them or sitting on the fence? But we're not talking wearing your pants over your tights, Superman style. Just in case you were wondering. 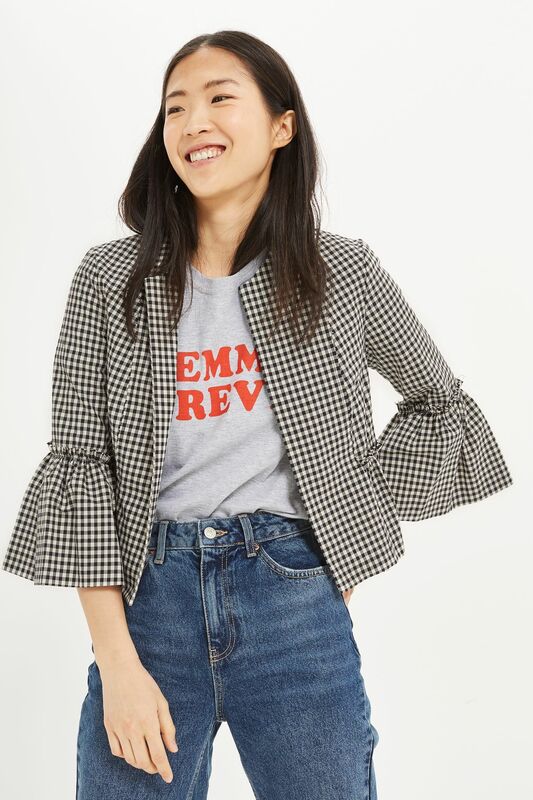 I'm interrupting my series of posts about the five top trends on the High Street this Spring, to bring you this quick Wardrobe Update. The interruption is largely due to the fact that I will have an abandoned child at a train station in Birmingham if I do the post that I was planning on doing but it's also because I really like this look - and if like me you're not so good with a plain t-shirt, this might just be for you too. We've seen bralette tops making a big splash this spring, not only as underwear but as outerwear too and this is how the look is shaping up....Fancy trying one? No? Why ever not? So in comparison this is a very tame look. OK so your husband/partner/children may well ask you if you've put your clothes on in the wrong order but what do they know about fashion? Pah! 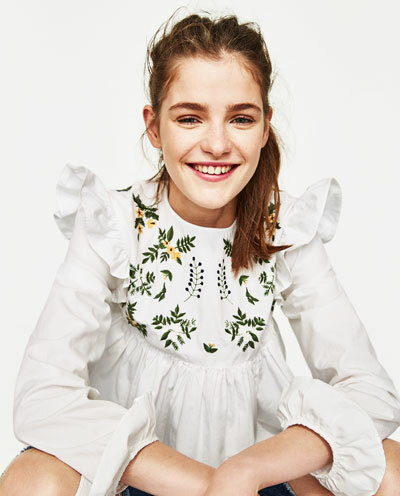 Nope, this is the quickest way to update your look. Chuck on a t-shirt, bang a pretty cami over the top. Job done. 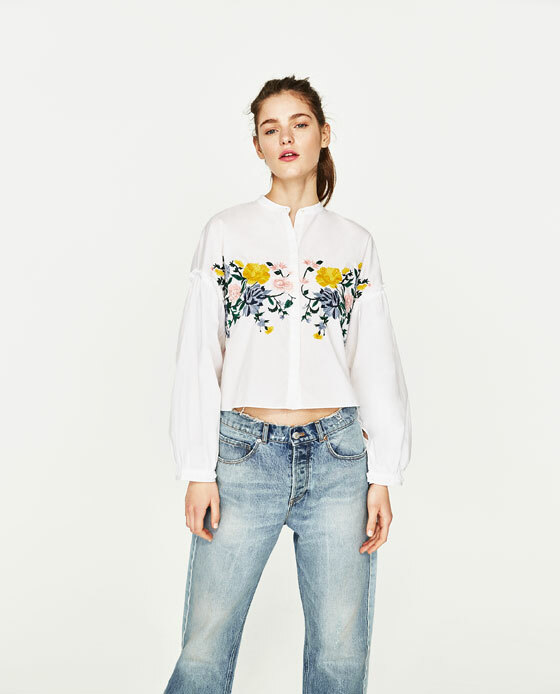 Or if you're uber lazy like me, you can buy this Zara top and t-shirt (£17.99) and the work has already been done for you. That child* that I mentioned. Well she's now been officially abandoned. Ooops. * said "child" is now over 18 so please don't call Social Services. Watch your backs ladies! There's a lot going on behind us at the moment! Whenever I pick something up I find myself turning it round to see what is on the back, because that's where it's all happening and that's where the interest is at. 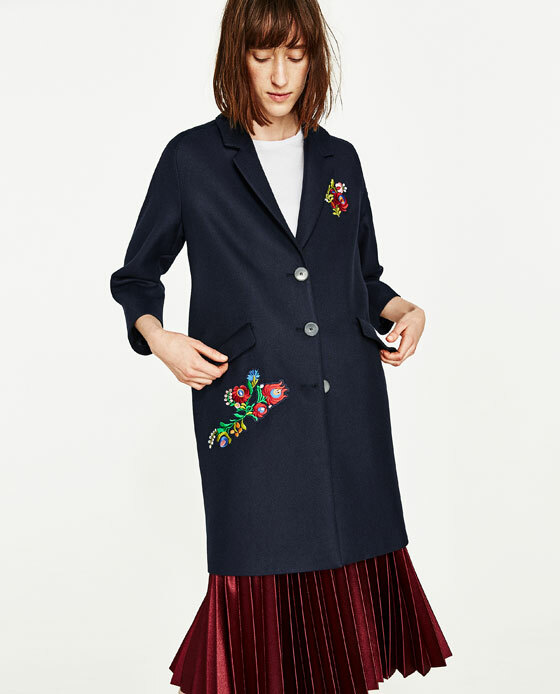 Kicking off with a spring coat at Zara in classic navy, which is gorgeous. Just see what is on the back! It's so pretty. 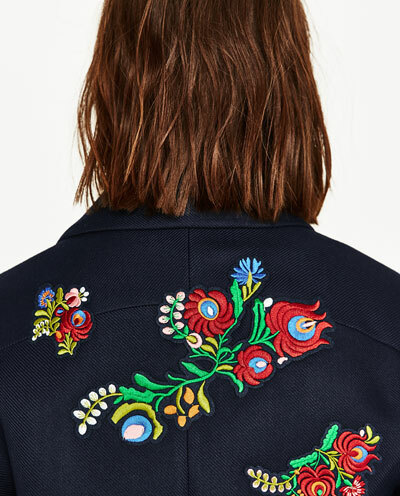 I love the bright colours against the navy coat and here again we can see the embroidered trend stealing the limelight. and on the back we have....A LOT going on! More pom poms, brights, zig- zags. It's a marmite item, I get that. But I think that it's brilliant! This jacket is a real treat and could (arguably) slot its way into a wardrobe quite easily. 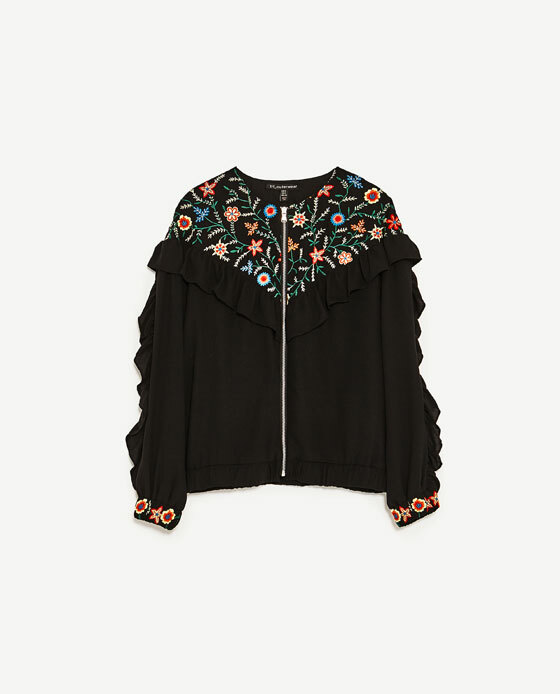 It's more bomber in its style but being navy, frilly and blingy on its back (and front) it still has a very feminine feel about it. So ladies, watch your back. You don't know what's lurking behind you! Over the next few posts, I'm going to take a look at some of the big trends hitting the High Street. As with each season, there are distinct and definite trends, although having said that there is some merging and cross-referencing of trends along the way. 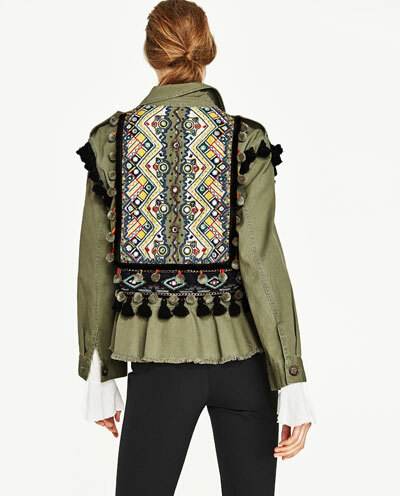 And the best way to bring yourself up to speed is to take a wander around Zara. Their stores are laid out in really clear trends and in colour packages too. Even if you don't buy, it's still worth taking a look - and chances are if you're anything like me, something will grab you! The first trend I'm going to look at is "Army". 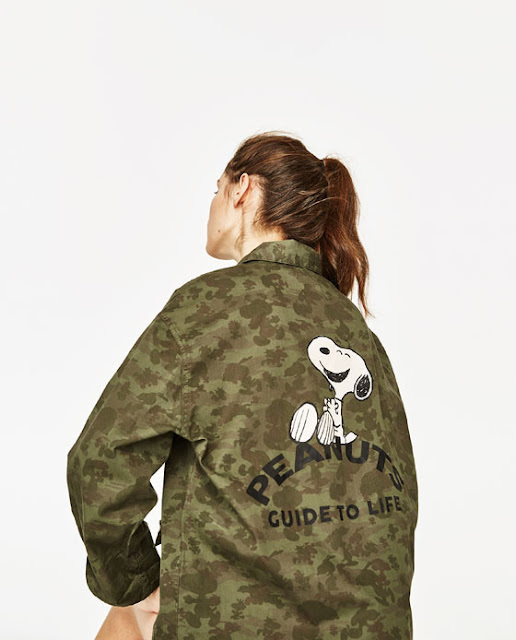 Its influences can be seen not just in the traditional camouflage sense, although there is plenty of camo around, but in badges on shirts and in subtle detailing too. This is also a subtle nod to military styling, the main reference being simply to it's khaki colour. It's a lovely soft tencel so easy to wear, great on a hot day, for travelling in, or over swimwear on the beach. A shirt, or top, is such an easy way to tap into any trend. 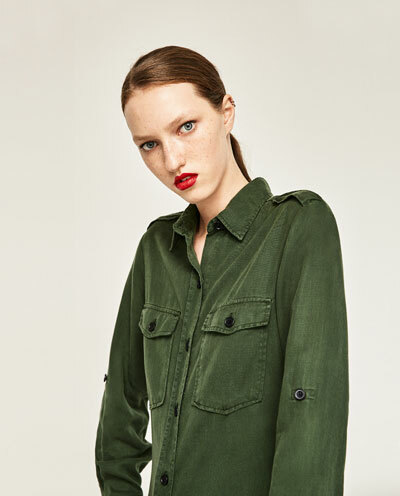 This New Look embroidered trim military shirt (£22.99) is a great option for anyone - and I include myself in this - who prefers some feminine or pretty details alongside the more utilitarian army type feel. 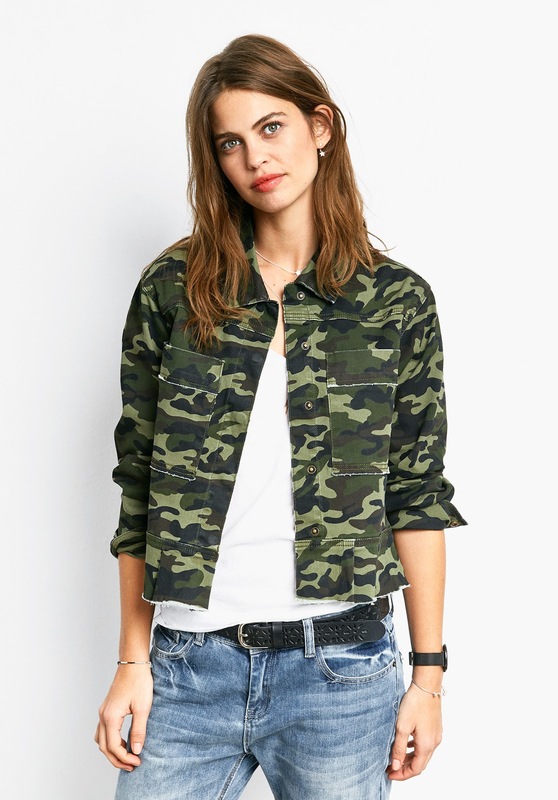 Camo shirts were a huge trend last summer and they are back again. 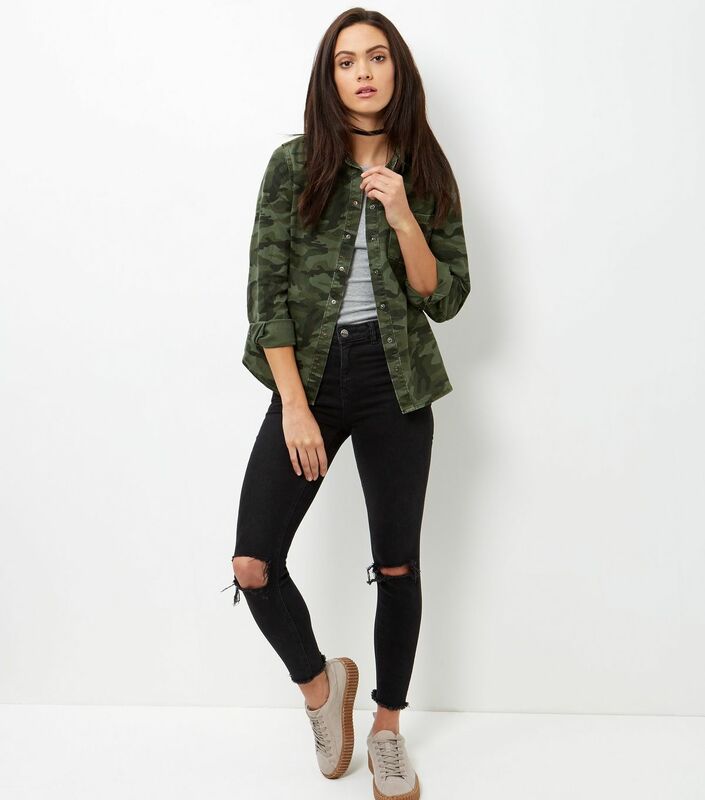 I bought one from New Look at the end of last summer and this year it's been repeated (New Look green camo print shirt £24.99). It's 100% cotton and fairly thick, so it could double up as a jacket on a warmer spring day. Oh, and if you're wearing cut offs but want to cover any less than toned bits at the backs of your legs, just tie it around your waist and rock your inner Cara at the same time. Who says that you can't look cool whilst covering cellulite?! So now we're getting to the real deal in the form of Zara camouflage cargo trousers (£29.99). 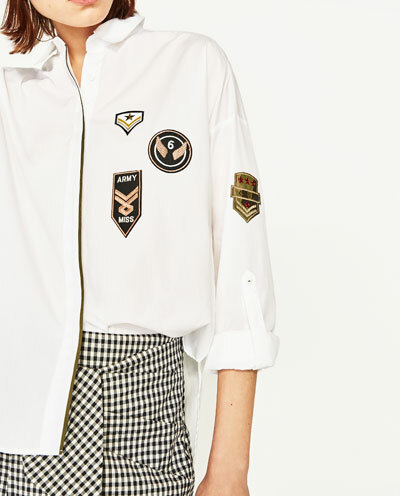 Side pockets always remind me of the band All Saints. I know, I'm showing my age! 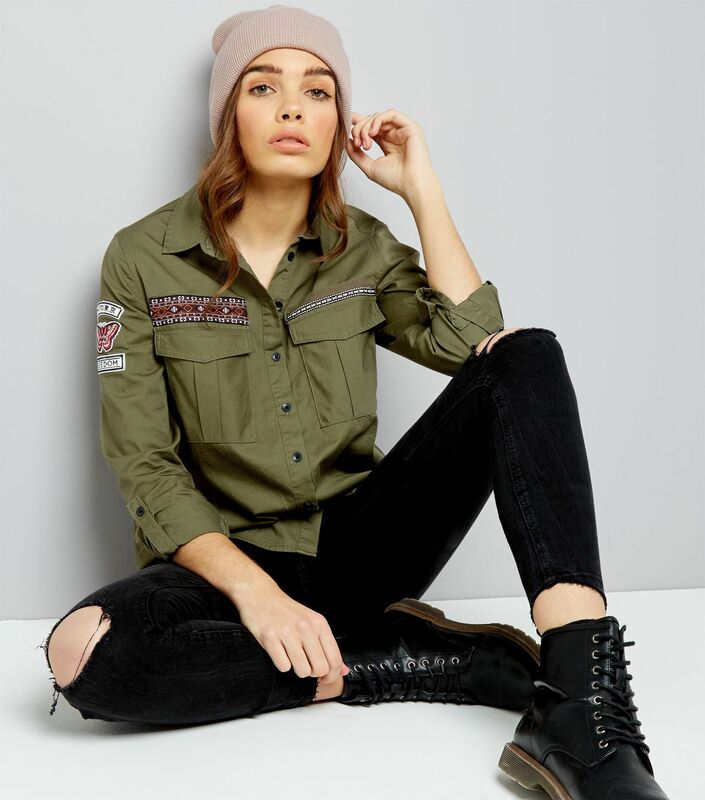 They can be kept quite "tough" with a slogan t-shirt and biker jacket, or prettied up a little with an embroidered top - of which there are many and which I'll be looking at in a future post. Coming on to jackets, there's the Hush Kafka jacket (£70) which is a great choice. I like that it's not too long so you can see a jeans belt. Belts - they are having a revival in a big way! And if you have a wardrobe full of denim, navy and black, a camo jacket will work its way in there nicely. 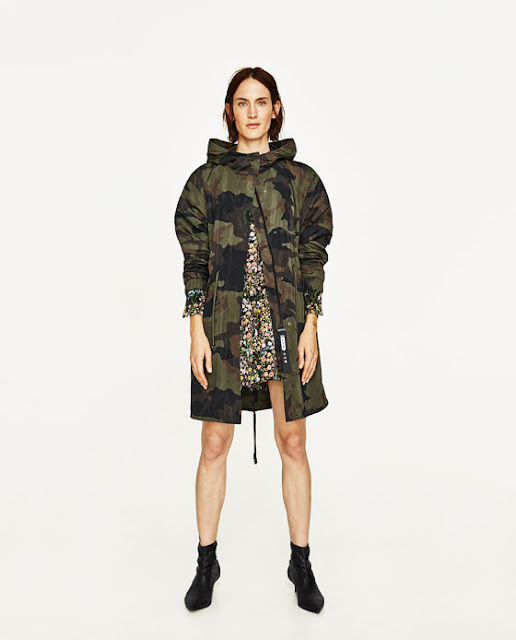 For something a little more full on in the army style stakes, there's the Camouflage print parka Zara (£49.99). 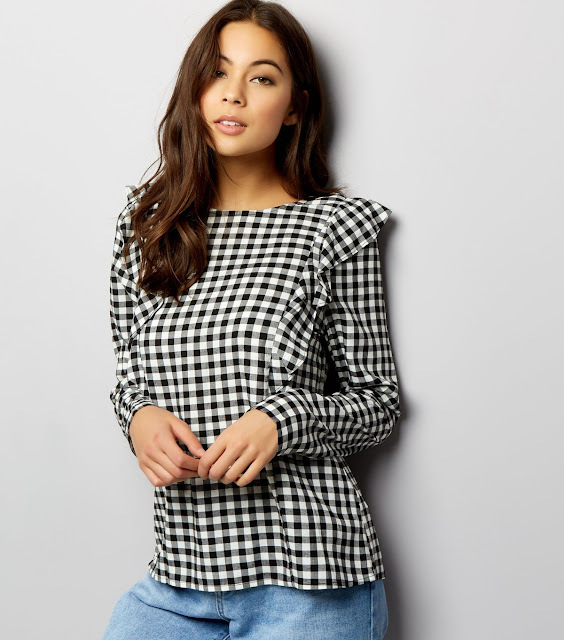 I like the styling of this with its statement neckline and big sleeves plus it has a hood and a waist tie, so you can create some shape at the waist. 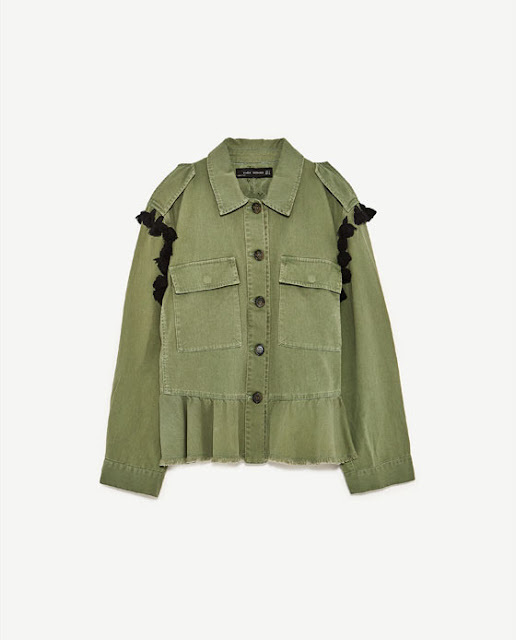 And if you're out and about a lot pushing a pram, going on long walks, in and out of the car, or just because you fancy it, this is a versatile spring coat. The jumpsuit and leopard print heels post! Whenever I post a picture of this jumpsuit on Instagram, people seem to really like it, so I thought that I would try and find some that are similar, which of course provided harder than anticipated! I'm not quite sure what it is about a jumpsuit that appeals in particular but I know that whenever I see one on someone I really like it - they just look quite cool and stylish (not that I think that when I look in the mirror I hasten to add - only when I see others in them). And when it comes to wearing them, they are so comfortable. I've done long haul flights in mine and it's worked so well, despite there being the potential for loo issues! It's a one stop outfit which really only a dress that can compete with but a jumpsuit is so much better. 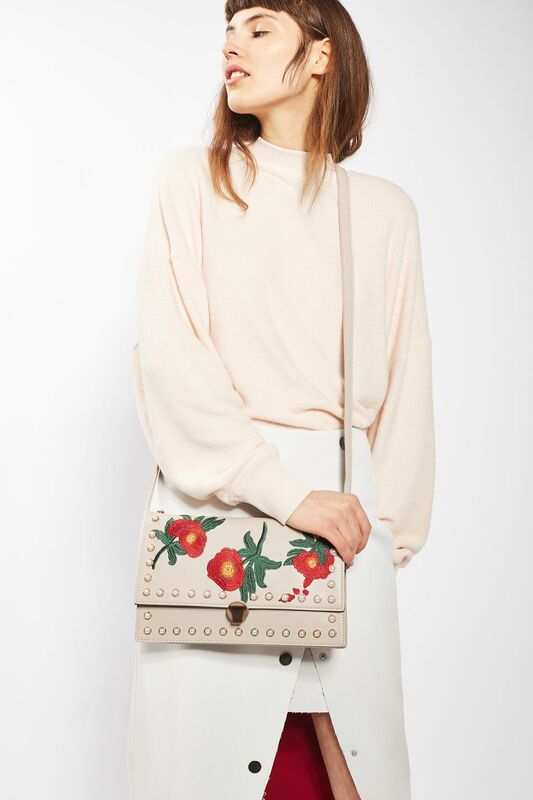 Comfortable, able to be layered, can be worn with flats or for a night out, wear with a leather biker or a blazer. A jumpsuit is the perfect piece for a weekend away on hand luggage only. This lyocell blend jumpsuit from H&M (£39.99) is one of the best options that I've come across. It's from their conscious range and comes in sizes 6 to 20. It's the most similar in style to the one I'm wearing insofar as it has long sleeves and the trouser hem isn't cuffed. I think that I could quite easily be persuaded on this one too. 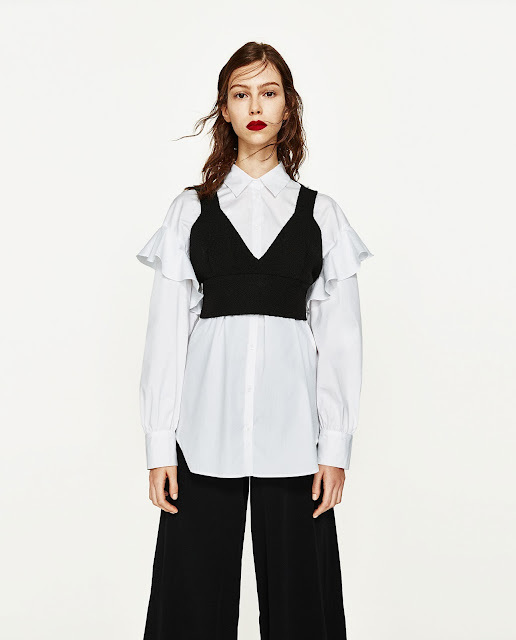 The soft utility jumpsuit from Oasis (£52) is made from modal (65%) and polyester (35%) which will give it its softness but I'm slightly concerned about the VPL issue with this one and wonder whether it might just be a little too soft. Nevertheless it made it into my top 3. It comes in khaki as well as dark grey, both of which make a softer change to black. At £75 the Hush jumpsuit is the most expensive but this too is a gem. I bought it last year and wore it virtually non stop when I was away with work for a couple of days. It was so easy to style in different ways and it was hugely comfortable too. Because it was around last summer, it has 52 reviews for you to read and it has been awarded five stars. I haven't managed to find a denim one, despite much searching - but I will keep on looking. 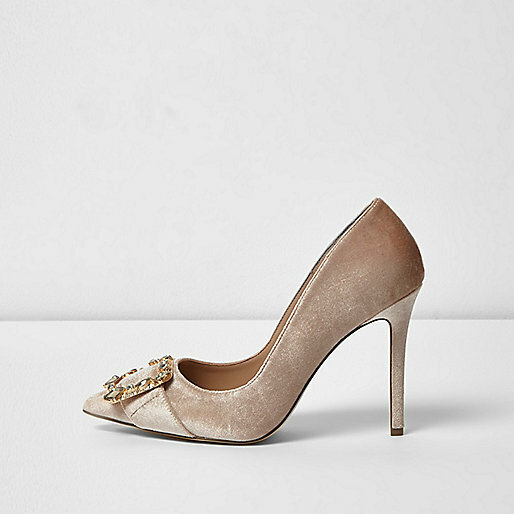 And as for a word about the shoes, these are my favourite heels at the moment. 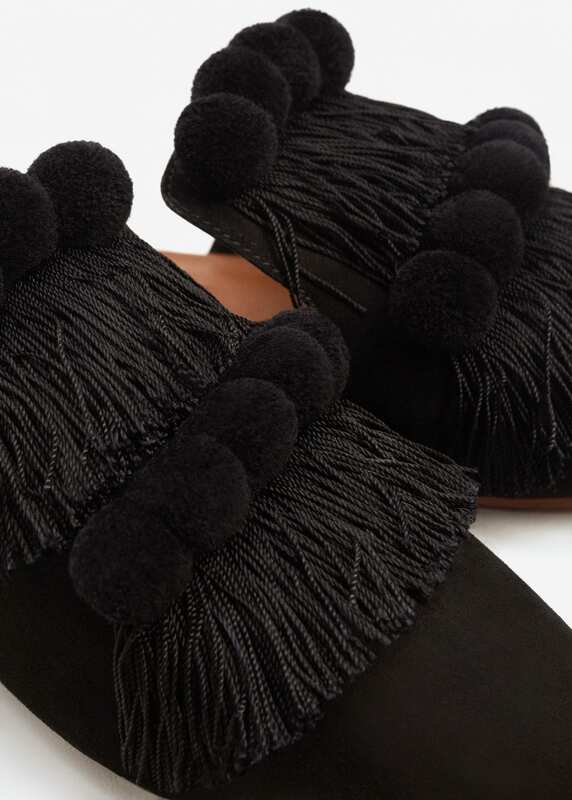 They are velvet and wearing them is like wearing slippers. They come in nine finishes, including metallic, orange and pink velvet (unsurprisingly I have my eye on those too!) 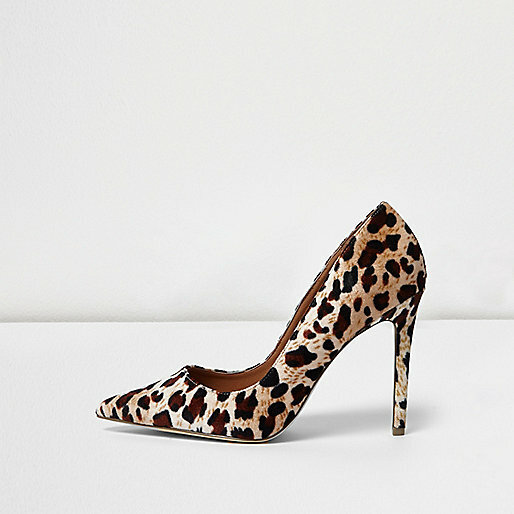 Because I'm not great in heels for any length of time, at £35 these are the right price for me.